Mike Incorvaia remembers hiking Bailey Mountain in East Otto, N.Y., with his dad and uncle when he was a teen. It was an inspirational place at one of the highest points (1,800 feet above sea level) in Cattaraugus County. From certain spots on certain days, you can even see Lake Erie. So, it’s no surprise that as soon as he got the chance as an adult, he and his partner in the project, Donald Matre, bought 300 acres on the mountain. After several years of careful thought and research, the partners decided to develop it. But it wouldn’t be just any development. It would be geared toward families who wanted to live and/or vacation in a secluded, peaceful, natural setting with easy access to Ellicottville, Holiday Valley, HoliMont, Griffis Sculpture Park, state parks and all the other attractions the area has to offer all year round. To that end, Incorvaia has created a thoughtfully designed housing development, which will eventually include 32 chalet-style homes, with 3,000 square feet or more, on 5 acres each with plenty of surrounding land available for hiking, mountain biking, fishing, picnicking and more. 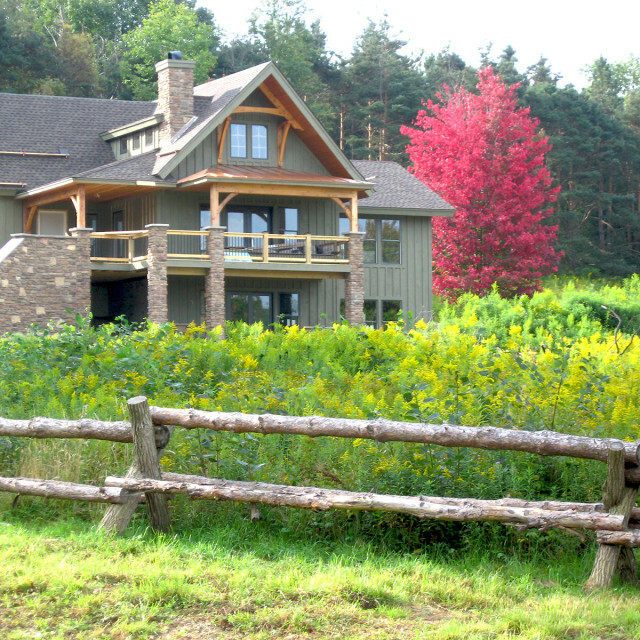 The development is called Lofty Mountain Grandeur, a name inspired by the hymn “How Great Thou Art.”It is just a nine-minute drive to Ellicottville, a one-hour trip to Buffalo, 2.5 hours to Toronto and zero hours to total calm and relaxation amid nature’s beauty. Phase 1 of the project – the Bailey Hills section – began in 2009 when few were building new homes because of the recession. Undaunted, Incorvaia broke ground, believing that his special place should be shared and that once people saw the area, they would fall in love with it, too. Bailey Hills features 13 lots (only one is still available) and 12 beautifully crafted homes with astounding views. With pricing starting at $399,000, homes feature first floor great rooms with vaulted ceilings, pegged timber beams, 6-inch wide white oak plank floors with radiant heat throughout, plus two first floor bedrooms and two baths. On the second floor is a loft overlooking the great room, along with another bedroom and bath. Basements have room for two additional bedrooms and two baths.